As the driver, you want to keep the loads center of gravity low to prevent tipping. Vans, or non-refrigerated semi-trailers, are often loaded via a hi-lo or pallet jack. Although sometimes the van will be hand stacked. Hand stacked loads are notoriously difficult to secure unless the freight is made up of a few very large objects. Hand stacked loads should be stacked in a tiered style. This allows the weight of the freight to be tiered uniformly. Overlapping of rows decreases the chances of the load shifting. Pallet loads should have the pallets placed tight against the pallet directly in front of it and tight against the walls. This allows an individual to walk down the center of the trailer in between the pallets. Using load bars can be useful if the load will not be accessed more than once or twice. However, if you have numerous stops on one trailer, then load bars will do little to secure the load. Using cargo straps and well wrapped pallets will be the best way to keep cargo secure. To maintain an even temperature throughout the trailer, air must be allowed to circulate around the load. Spaces must be around and between each row. If you are hauling a trailer where only part of the load is refrigerated, cargo securement can present an extra challenge. The cargo is often access through a side door, making it hard to properly secure the load. If the cargo is not stacked correctly it can easily fall out on your head as you open the door. To prevent serious head injuries caused by falling frozen cargo, stand to the side when opening the door. In order to secure a flatbed load, you will use cables and winches, webbing straps and winches, or chains and load binders. Ensure that whatever tie down you use is strong enough to hold the load through normal driving conditions, including steep hills, sharp turns, high winds, etc. Review FMCSR Part 393.110 for details regarding the number of tiedowns and the specific placement. The goal is to prevent the load for shifting in any direction. When using a chain, you must have a binder as well. The purchase of the binder is to tightly secure the chain. You cannot do that just by hand, you must have a binder. If you are having difficulty snapping the binder over, slip a cheater pipe (also called a swamp pipe) over the binder handle. Make sure it fits over the entire length of the binder handle before pulling down or the pipe could slip off and hit you in the eye or on the head. 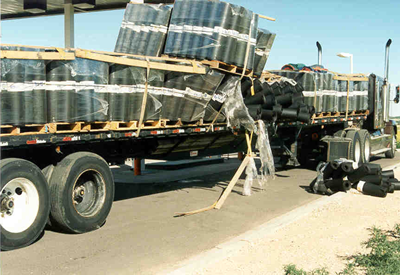 If the tiedowns might damage the cargo, use “v boards” between the tiedown and the load to prevent damage. The block should fit snugly against the cargo. Secure the board to the floor by either nailing it to a wooden floor, or changing to a metal floor. If you need to use a tarp to protect your load, place it on the load after already securing the load itself. Then tie down the tarp tightly to prevent wind from ripping at the edges and ripping off the tarp as you drive down the highway. The box of the trailer is a method of securement, however, cargo can and will shift during transport if not properly secured within the trailer. Not only is it important to prevent loads from shifting to stave off damage, but it also is important so that cargo does not become unevenly distributed over your axles. When going through a weigh station the entire load is weighed and individual axles are weighed. Being overweight on one axle can sideline you until the issue is corrected. It can also result in a heavy fine and an impacted CSA score for you and your company. How you drive will always affect your cargo. If you drive erratically through the complicated highways of Texas, for example, your cargo has a better chance of coming out of its securement. The weight of your load will affect how quickly you can take off from a stopped position and how quickly you can stop. Heavier loads make starting more difficult whereas a lighter load makes stopping more difficult. If the load is improperly distributed over the axles, it could result in tires losing contact with the road and causing the semi to skid. The heavier the cargo is on the steering axle the harder it is to steer into a turn. However, too much weight on the rear axle will make the steering axle too light which also reduces one’s steering control. For drivers who may find themselves in areas of heavy traffic such as the I-75 found in Florida, keeping watch in reagrds one’s turning is paramount to road safety. 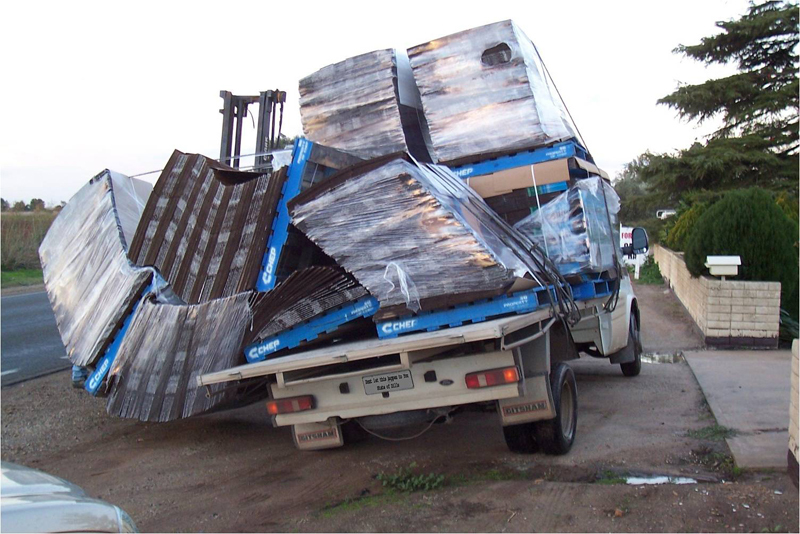 Badly loaded trailers on a curve could result in the trailer tipping over. If it is a poorly loaded flatbed, the load could shift and the gravity of the curve could result in the load breaking free of its tiedowns. Drivers need to be aware of how treacherous their route may be – Highway One in California is a notoriously twisted stretch of asphalt. If you have ever had the opportunity to drive through the Smokies in Tennessee you know all about steep grades. There, it is so steep, that they have sand runoffs for runaway tractor-trailers. How your loaded trailer responds on a steep grade is very different than how your empty trailer will react. Knowing how to shift through steep grades will prevent you from stalling on the upgrade, or incurring brake failure on the downgrade. Whoever loads you may be taking on, a trucker needs to understand the elements of load shift. If they have no comprehension of what happens to a load during a run, the way they load will be less effective. If you are unable to take a loader out on a run with you so they see the effects of load shift, then encouraging management to provide videos in the loader training program is your other option. It is never in your best interest to denigrate the loaders. Rather, work with them to help them fully appreciate how they do their job will directly affect your safety and that of all you share the road with. If you can appeal to something personal in their life, such as stating how when you are safely loaded, you are less likely to be in an accident that could harm a mom and her kids in the mini-van on the way home from school, you may reach them effectively. Ultimately, you want to appeal to that part of them that wants their family to come home safe every day. As with any other facet of your truck driving job, how your trailer is loaded will directly affect your performance. Conversely, how you drive will directly affect your loads securement. Despite that, it is not a no-win situation. By taking the steps of making sure the load is properly secured prior to leaving on your run, inspecting your load regularly throughout the run, and driving safely, you will deliver your cargo undamaged every time. Check load securement as part of your pre-trip inspection. Re-inspect within the first 50 miles, when you will encounter the most cargo shift. Thereafter, check the load every 150 miles or three hours. I should perhaps take a brief moment to add a small caveat. There are matters beyond your control. If the product within the packaging is poorly packed the load can shift and that would be beyond your control and beyond the loaders control. So, when I state you can deliver cargo undamaged every time, it is possible only within the parameters of what you can control. Just like you cannot control someone running a red light, you cannot control how a manufacturer packages a case of motor oil. You can only control whether it is loaded on the bottom or the top of the pallet of product. You know you trucking job is important. So, you must always treat it as such. Stay safe out there!